Patricia Delgado. Photo by Gio Alma, Courtesy Delgado. Patricia Delgado surprised her many fans last March when she announced that she'd be leaving Miami City Ballet after nearly 20 years to move to New York to be closer to her boyfriend, New York City Ballet soloist and resident choreographer Justin Peck. Though she took a risk stepping into the unknown without a sense of where her career would take her, it's paid off: this year we've seen Delgado pop up everywhere from Christopher Wheeldon's concert production of Brigadoon at New York City Center to dancing alongside Peck in a music video for the indie rock band The National. Now, Delgado is embarking on a new challenge: modern dance. On March 7 Delgado will perform at The Kennedy Center as part of Damian Woetzel's DEMO series in two works by postmodern choreographer Pam Tanowitz. Delgado and Tanowitz first joined forces last summer at the Vail Dance Festival, where, as a complete surprise to Delgado, Tanowitz created a new work, Solo for Patti, on her in just five days. Delgado describes that time as a kind of modern dance bootcamp. "Even though I was in my pointe shoes, we were playing with taking away a lot of my ballerina-isms," she says. "Pam is very interested in clarity and shapes and not using emotion, but having a blank slate of a facial expression, which is so counterintuitive to me." Though Delgado could have let frustration and self doubt get in her way, she decided to embrace Tanowitz's vision completely; when they both returned to New York after the festival, their collaboration continued. 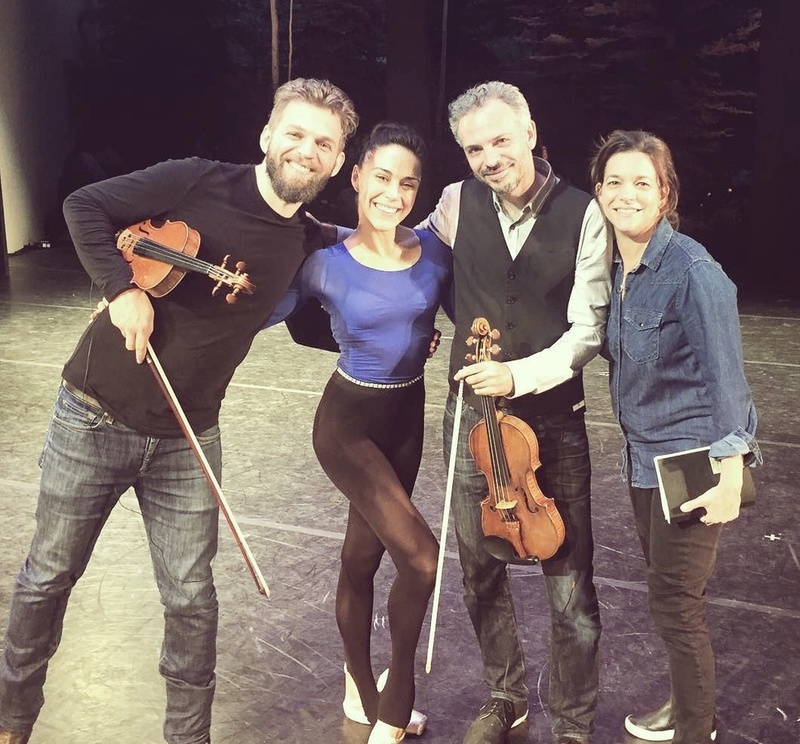 Delgado (second from left) with Tanowitz and musicians at the Vail Dance Festival last summer. Photo Courtesy Delgado. Next week's performance will show the fruits of those efforts; Delgado will reprise Solo for Patti and will dance in the world premiere of a trio titled Blueprint alongside two male dancers from Tanowitz's company. "The new piece is much more modern," says Delgado, noting that she initially "felt like a fish out of water." To prepare, she's been taking Cunningham classes. "They're really hard and I have to completely leave judgement at the door and be really open to feeling out of my comfort zone, but I try to just go in there curious." Although Delgado performed contemporary works by choreographers like Paul Taylor and Twyla Tharp at MCB, she explains that she was dancing them as a ballerina. "There's only so much ballet technique you can let go of when Paul Taylor's Mercuric Tidings is on the same program as Theme and Variations," she says. With Tanowitz, she's trying hard to dive in fully. "I don't want to look like the ballerina in the trio." Peck and Delgado preparing to set "In Creases" at Boston Ballet. Photo by Sabi Varga, Courtesy Boston Ballet. In addition to adding modern dance to her resumé, Delgado has also stepped into the position of repetiteur: She set Peck's In Creases on Boston Ballet for their spring season, opening March 9. "I was so nervous, more nervous to do this than any performance I'd ever done," she says. But she overcame her fear, and came to love the process. "I think it helped that I can still put myself in the shoes of a dancer," she says. For example, she made it a goal to work with as many casts as possible, and gave each group an equal chance to try things out in rehearsal. She left after two weeks feeling very proud of the outcome. "I love what the lightning, visceral impetus of Justin's ballets did for me as a dancer, and I wanted as many people as possible to feel that." This may be Delgado's first experience as a repetiteur, but it certainly won't be the last. In May she'll head to the Dresden Semperoper Ballet to set Peck's Heatscape with her sister, MCB principal Jeanette Delgado, and she may have the chance to set In Creases again at Vail this summer. She'll also spend a few weeks in April as a guest ballet master at Cincinnati Ballet and is piecing together summer festival plans at the Nantucket Atheneum Dance Festival and Isabella Boylston's Ballet Sun Valley. Despite her busy year, she admits leaving the company that she called home for nearly half of her life has been anything but easy. "I'm going to cry as I tell you this," she says over the phone. "Specifically what I miss is company class and watching my peers dance all day. Not having that camaraderie daily is really tough." Yet the highlight of the past year has been the excitement of the unknown. "Every day is a mystery," she says. "Sometimes I don't know where I'm going to take class, who's going to teach, if there'll be a free studio, what email I'm going to get about a potential opportunity...but every day I'm like, 'Wow, I'm free to do whatever I want!'"